I am not sure if CamSur’s smart looking governor Migz Villafuerte understands the implications of Section 8, Article V of the Bayanihan Federalism constitution, but he seems quite enthusiastic about supporting it. Infact, in October, Villafuerte is expected to lead “new recruits” to the PDP Laban as they take their oath of allegiance to the party that has been pushing for federalism perhaps longer than the Villafuertes have had Camsur in a choke-hold. The supposed gathering of thousands of government officials of all levels in CamSur happens conveniently after the filing of certificates of candidacy. Section 8, Article V of the proposed constitution is the self executing anti-dynasty provision which bans members of the same family (up to the second degree) from succeeding one another or holding multiple elective positions. In short, this will end the reign of the Villafuertes and possibly allow for other political leaders to emerge in CamSur. The Villafuertes have been the ruling political clan since 1986 when Luis Villafuerte Sr. became governor and held the post till 1992. His reign was briefly interrupted by Jose Bulaong, who served as governor from 1992 to 1995. Villafuerte Sr. then took back the governorship from 1995 to 2004. 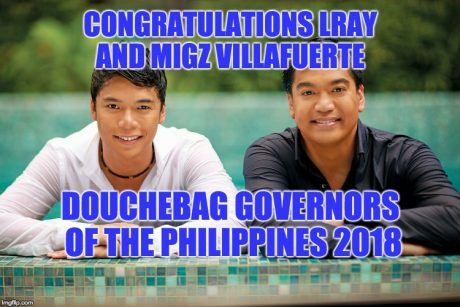 The Villafuerte patriarch was then succeeded by his son, Luis Ray or Lray Villafuerte, as governor. His son served as governor from 2004 to 2013 and thereafter, was succeeded by his son Migz Villafuerte, who is gunning for this third term as governor in 2019. What has a succession of Villafuertes given Camarines Sur? Poverty, for one. An article published in Manila Times says a report from the Department of Social Welfare and Development in 2016 said that CamSur is the poorest province within the Bicol region. The province of Camarines Sur has the highest percentage of poor households with 34 percent or 126,476 identified poor households; Masbate – 77,227 or 20 percent; Albay – 69,681 or 18.8 percent; Sorsogon – 48,555 or 13 percent; Camarines Norte –32,190 or 8.7 percent; and Catanduanes –15, 266 or 4.1 percent. In the sea of poverty in CamSur, the Villafuerte’s standout with former governor now congressman Lray being the richest among his fellow Bikolano legislators in the House of Representatives with a networth of nearly P250 million and his son Migz being the third richest governor in the Bicol region with a networth of nearly P22 million. What explains the Villafuerte’s wealth? Can anyone guess? Almost any search of Lray’s name on Google turns up stories accusing him of billions of pesos worth of graft and corruption. Which makes it unbelievable that his net worth is only a quarter of a billion pesos. Politics in our country is the road to wealth. Once a political family is in politics, they steal from government funds; and use it as political capital . So, every family member, from wife to son, to cousins, to relatives become a political dynasty group that can win elections. public offices. They were not talented public servants. In truth, they went to public service to protect and expand their own interests. Of course, there are family dynasties, with able members. But most of our political dynasty families are crooks and self serving, while their constituents remain poor ! Never heard left-behind colonist mestizo class and Chinese attacked by brown-skin-run Philippine Fake News. WHY? QUIZ: Which one of the above closer to the truth? The urge to find the real facts is destructive only to people or systems (friendships, family dynamics, political dynasties) that are based on lies. The truth can scare you half to death, but it’s never as destructive as deception. FaiLipines Fake News do not tell truth … they print gossips … the subject of gossips go to Fake News and tell their views … then the gossipers go to Fake News and tell more gossips …. and print …. and that is how news is gathered in the FaiLipines … and the people just do not know about it …. because they are FaiLipinos.